Russell Duncan's superb strike helped Inverness to victory in a lacklustre cup tie at the Caledonian Stadium. Duncan gave the home side the lead after 16 minutes when he fired a rasping shot from 20 yards into the top right hand corner of the net. Both sides struggled to find any rhythm with attacks breaking down due to poor passing in midfield. Dundee United thought they had equalised but Robertson's header was ruled out for offside. Inverness were without Dennis Wyness while United welcomed back captain Barry Robson from suspension. Arabs boss Craig Levein made one other change to his line-up from seven days ago, with Craig Conway coming in for Noel Hunt. With Inverness top scorer Craig Dargo sidelined due to suffering from the same injury as Wyness, Rory McAllister was afforded a rare start up front alongside Graham Bayne. Inverness took the lead after 16 minutes through a wonderful strike by Duncan. The midfielder collected a headed pass and fired a swerving shot from 20 yards into the top right-hand corner of the net. The visitors started in positive fashion following the interval and when Mark Kerr's deflected shot was not claimed by Fraser in a congested penalty area, Robertson headed into an unguarded goal. But the effort was correctly ruled out for offside. The rest of the game was short on quality football as both sides struggled to string passes together. 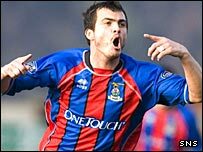 Inverness CT: Fraser, Tokely, Dods, Munro, Hastings, Wilson, McBain, Duncan, Rankin, Bayne, McAllister (McSwegan 66). Subs Not Used: Ridgers, McCaffrey, Black, Morgan. Dundee Utd: Stillie, Dillon, Wilkie, McCracken, Kalvenes, Kerr, Robertson, Robson, Samuel (Duff 74), Daly (Hunt 60), Conway. Subs Not Used: McLean, Robb, Kenneth.